Rows and rows of barrels at Goose Island Barrel Warehouse. Located two miles west of Goose Island’s Production Brewery sits the Goose Island Barrel Warehouse, also knows as the Staviary. This is where all of the barrel aging magic happens to finish creating its masterpieces known as Bourbon County Brand Stout. Goose Island BCBS inception took place according to Goose Island in 1992 when Greg Hall at the then Chicago based brewpub decided to barrel age a beer. Over the years this beer has taken on a cult like status that brings out many craft beer fans to seek out this white whale. As the beer progressed and gained more momentum over the years the brewery released variants of the base beer each year. 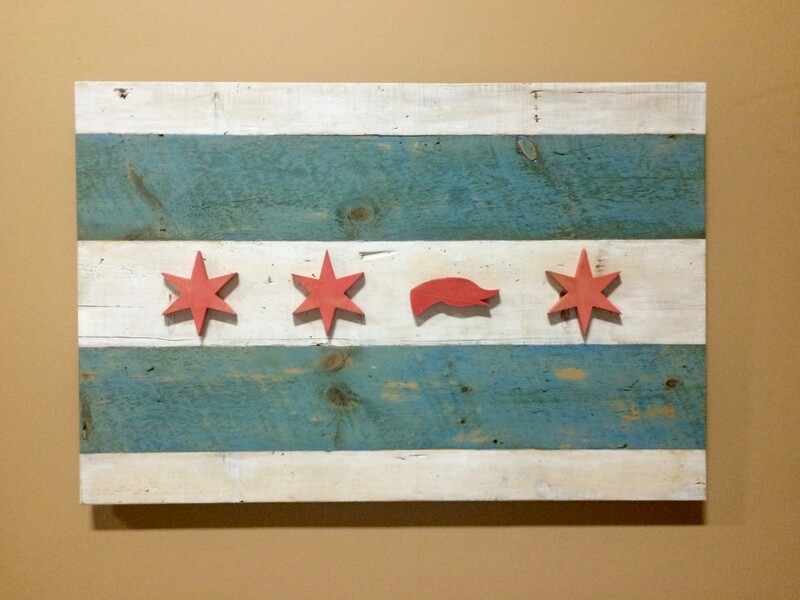 Goose Island modified City of Chicago Flag at Goose Island Barrel Warehouse. A little over a year ago Goose Island moved both its bourbon barrel and wine barrel warehouses that were located directly across the street from its Fulton Street Brewery to this new location. The new warehouse is a massive 133,000 square foot warehouse that makes up about 60% bourbon barrels and 40% wine barrels. Prior to the beer being filled into these empty casks the base beer is trucked over on a tanker trailer that holds the equivalent of 180 barrels of beer. It is then that the barrels get filled from a small team led by Eric Ponce, Barrel Program Director. And by a small team it is just that. We recently toured the Staviary and Ponce, a shipping manager and three interns lead this space. However this is about to change as Ponce is now in need of permanent employees to grow this space out. 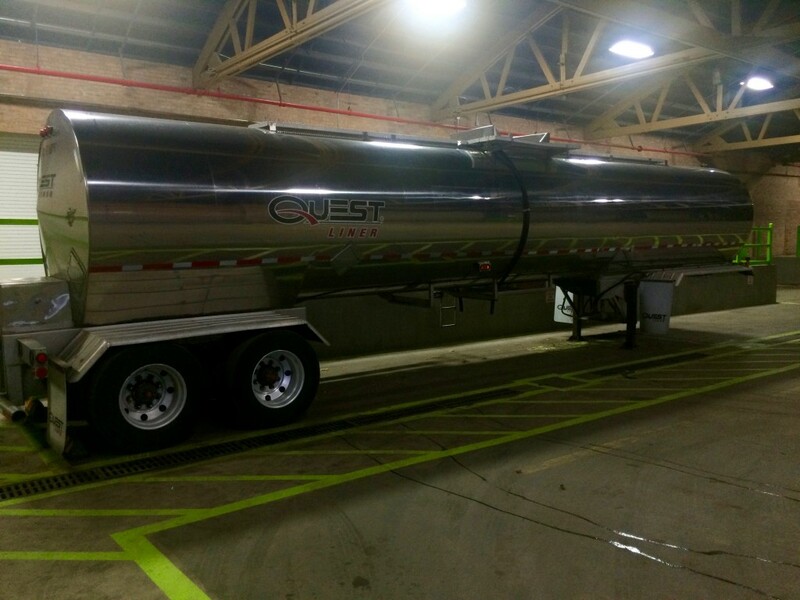 Tanker trailer that hauls 180 beer barrels from the Fulton production brewery to Goose Island Barrel Warehouse. Tanks at Goose Island Barrel Warehouse where the empty casks are filled. 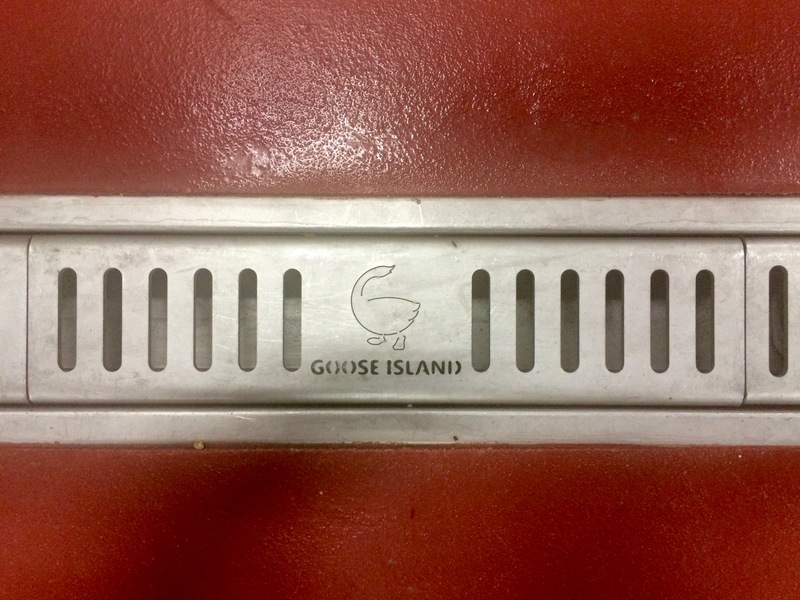 Custom stamped drain at Goose Island Barrel Warehouse. Walking the floor at the Staviary is an impressive experience. 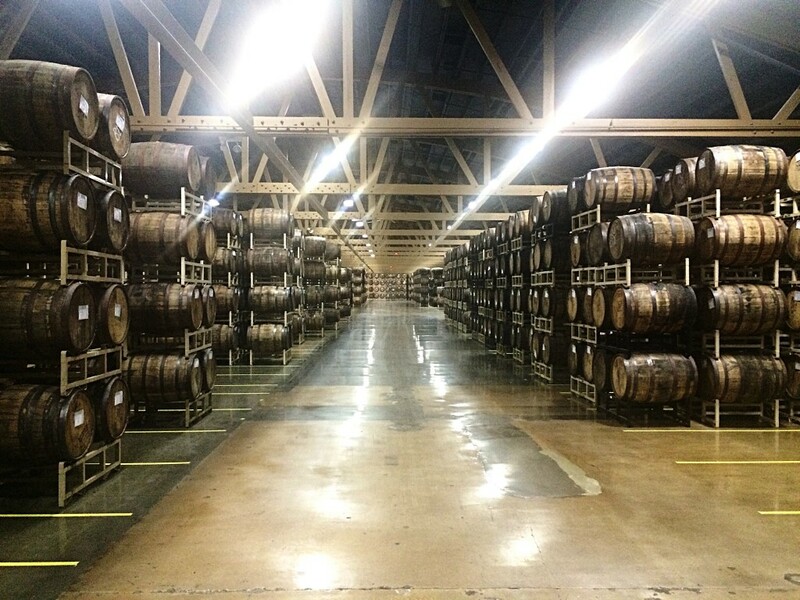 It’s amazing to see all of the various barrels that are aging away in the non-climate controlled facility. When it comes to BCBS its life begins with first-use bourbon barrels. The beer is aged inside for about 12 months to capture all four seasons, only using barrels that have held bourbon for about 8 years. 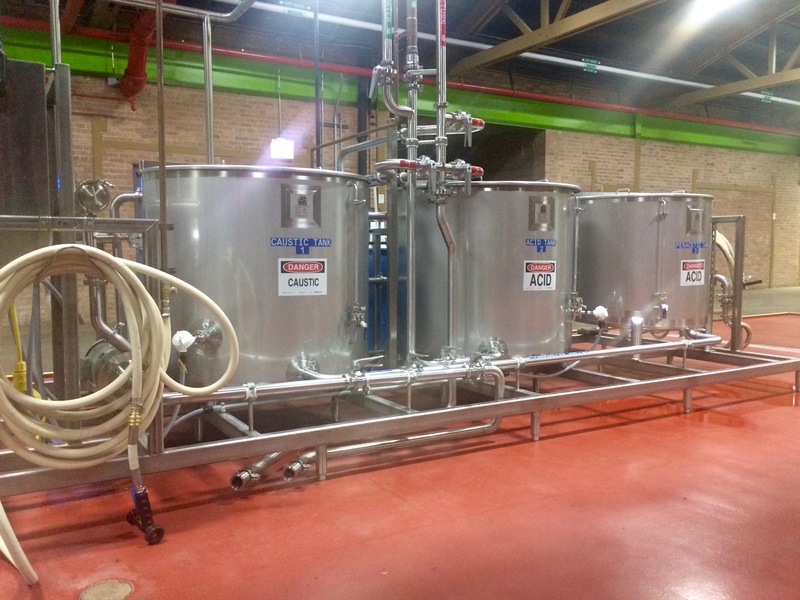 Being in a non-climate controlled space, this allows exposure to the extreme heat and cold of Chicago’s seasons, which contracts and expands the wood, pulling the barrel’s bourbon character into every BCBS. For BCBS the barrels are only used once and then some are reused when aging its Barleywine variant. 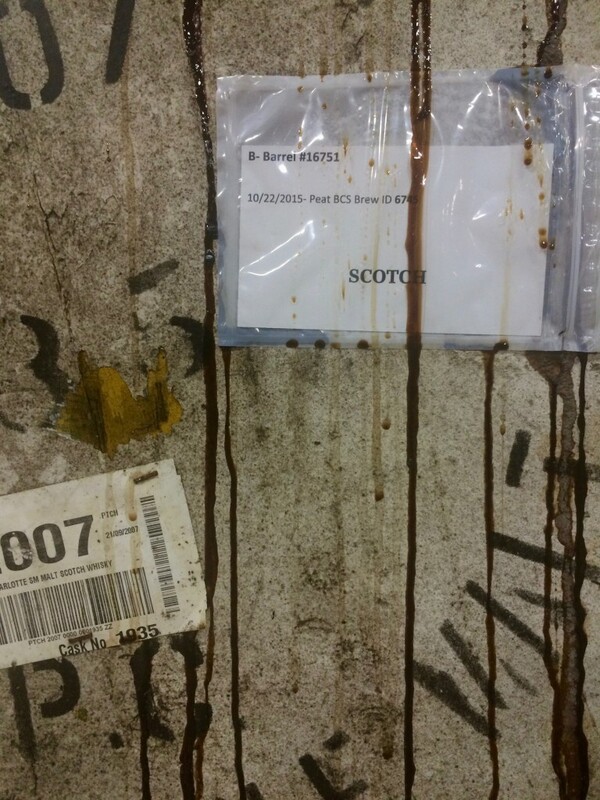 Single Malt Scotch Barrels aging for a future BCBS release at Goose Island Barrel Warehouse. 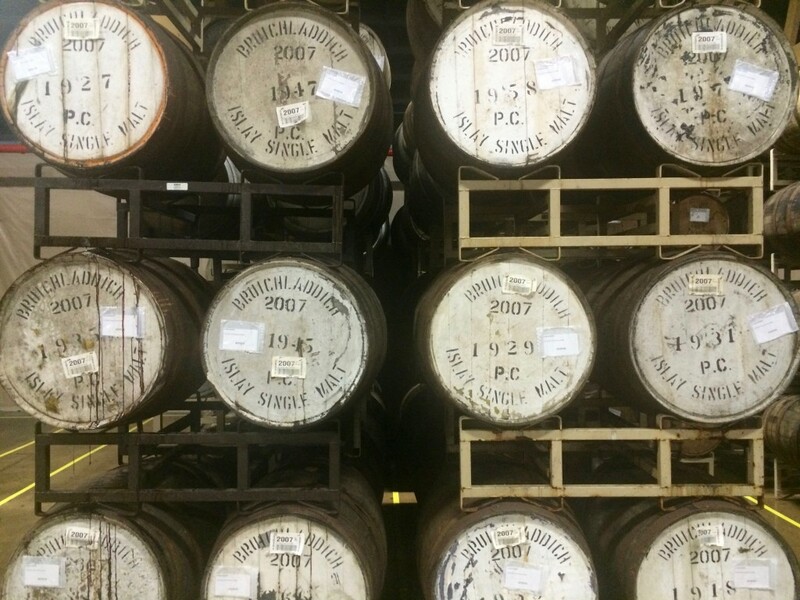 Single Malt Scotch Barrels aging at Goose Island Barrel Warehouse. 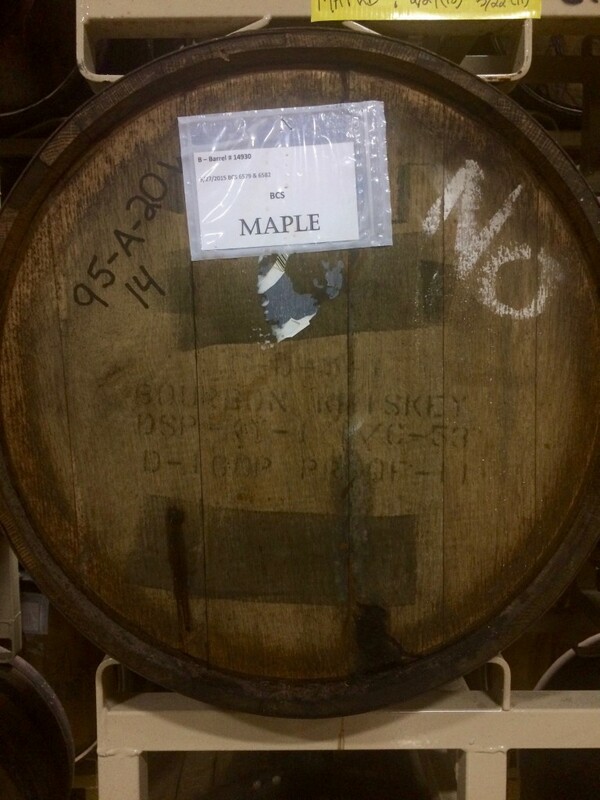 A barrel aging a future Maple release for Goose Island BCBS at Goose Island Barrel Warehouse. On a typical day Goose will fill about 120 casks. This year alone Ponce estimates that about 5,000 casks have been filled. Of all of these the brewery has only had to dump about 4 or 6 casks due to irregularities. Pretty amazing statistic when it relates to the size of its cellar. For 2015 Goose Island will release six variants of Bourbon County Brand Stout that includes Bourbon County Brand Stout, Bourbon County Brand Coffee Stout, Bourbon County Brand Barleywine, Bourbon County Brand Regal Rye Stout, Proprietor’s Bourbon County Brand Stout, and Rare Bourbon County Brand Stout. This year also marks the use of a new, elegant 16.9 oz or 500mL bottle that was designed by VSA Partners. The bottle has a look of a very nice bourbon bottle. This is the first time since 2010 that Goose Island has released its Rare variant. In 2010 this beer was aged in Pappy Van Winkle barrels and retailed for $40 per bottle. After sampling the 2015 Rare BCBS last weekend it is a simply amazing beer. It was aged in 35 year old Heaven Hill Barrels for 2 years. The major setback to this beer is that it will retail in the $60 range. Is it worth the price, that’s a tough decision to make but a great, complex beer is what awaits. The Original. Its nose is an intense mix of charred oak, chocolate, vanilla, caramel and smoke. One sip has more flavor than an average case of beer. Available nationwide. Everyday Goose Island smells Intelligentsia’s coffee roasting next to the brewery. This world class roaster puts the same craftsmanship into their coffee as Goose Island does with its beer. Each year this excellent coffee stout is made with a different bean variety, chosen in collaboration with our brewers and Intelligentsia’s experts. With the change in coffee comes a change in the flavor profile, making each release truly unique from the previous years. The 2015 incarnation features Intelligentsia Los Delirios coffee from Nicaragua. Available nationwide in limited quantities. Aged in the third-use barrels that were once home to Kentucky bourbon and then the renowned Bourbon County Stout, this traditional English-style barleywine possess the subtlety of flavor that only comes from a barrel that’s gone through many seasons of ritual care. The intricacies of the previous barrel denizens – oak, charcoal, hints of tobacco and vanilla, and that signature bourbon heat – are all present in this beer. Hearty and complex, Bourbon County Brand Barleywine is a titan and a timeline; a bold, flavorful journey through the craft of barrel aging. Available nationwide in limited quantities. A unique blend of Bourbon County Brand Stout aged in rye whiskey barrels with blackberries, Luxardo candied cherries, fresh sour cherries and sea salt. 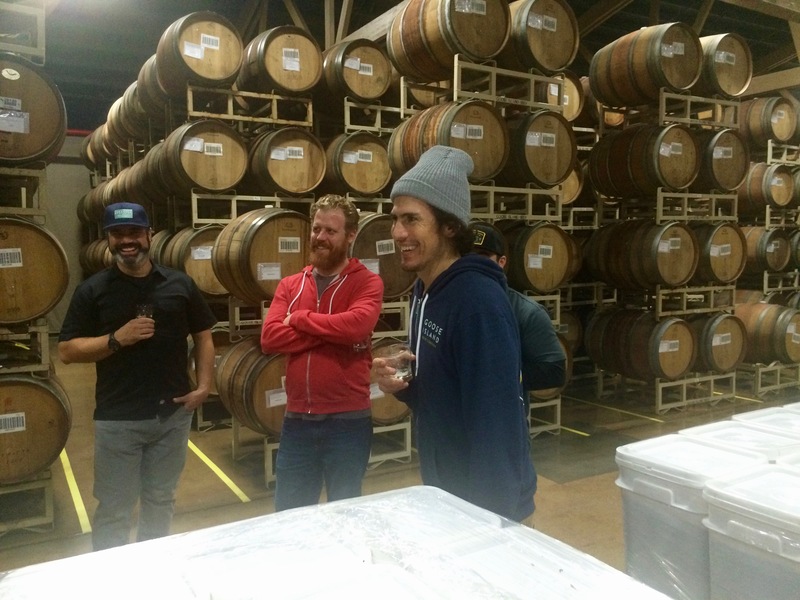 Developed by the team of Goose Island brewers, this year’s recipe was especially collaborative. The brewers submitted recipes, held a roundtable discussion dissecting each and in the end landed on Bourbon County Brand Regal Rye Stout. Available nationwide in limited quantities. The third annual release of Proprietor’s is aged in bourbon barrels and features maple, toasted pecans and guajillo peppers and is the brain child of female brewery, Di Rodriguez. This variant is meant to show Goose Island’s immense gratitude to their neighbors in Chicago – the loyal and adventurous fans whose support helped bring Bourbon County Brand Stout to towering new heights. Each year this release will differ from the previous year; a special variant created for Chicago and unique to the year it was released. Available only in Chicago. Back in 1979 the folks at Heaven Hill Distilleries filled a handful of new freshly charred American white oak barrels with some of their finest whiskey. It is rare for Bourbon to age in barrels for more than twenty-three years. But these barrels patiently sat for over thirty years. The extra years developed a distinct and complex character that makes them truly one-of-a kind. We filled those barrels with Bourbon County Brand Stout, and then stored them away in our Chicago Barrel House to age for two more years. With these rare barrels from our friends at Heaven Hill we believe this is one of the finest beers we have ever produced. 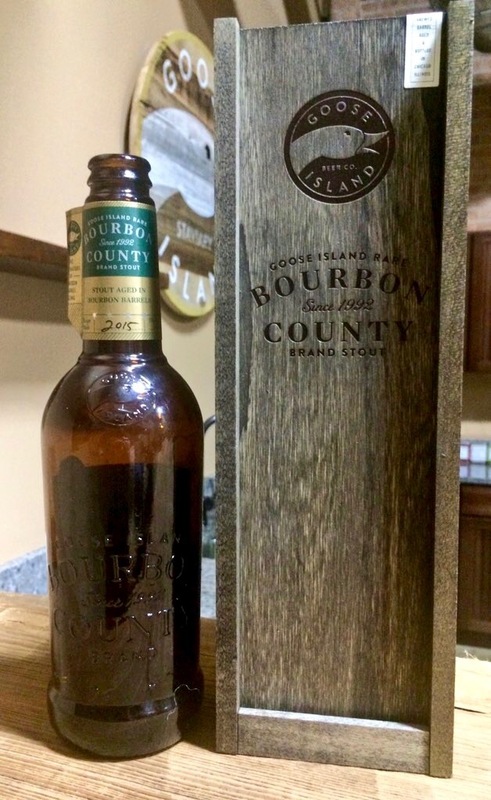 This is Goose Island Rare Bourbon County Brand Stout for 2015. A bottle of 2015 Goose Island Rare Bourbon County Brand Stout at Goose Island Barrel Warehouse. And to learn more about the process that Goose Island takes in brewing and aging its Bourbon County Brand Stout here is a video, Grit & Grain: The Story of Bourbon County Stout, that highlights this. In Portland Goose Island Bourbon County Brand Stout will hit store shelves beginning today, Friday, November 27. There will be many retailers across the Portland metro area that will be selling BCBS today and here are just a few that we are aware of. The releases begin early when John’s Marketplace will be selling its allotment of bottles beginning at 7:00am while providing donuts to those in search of this annual release. Saraveza will begin its sale when it opens at 11:00am. There will be a keg of BCBS being poured during Green Dragon & Brewpublic’s Black Beer Friday beginning at 11:00am. Beaumont Market will have a few varieties of bottles of BCS for sale too. Then at Noon is when a few of the larger events kick in. N.W.I.P.A. will be selling bottles of 2014 and 2015 BCBS will also be featuring a keg of BCBS Vanilla Rye from Noon to 8:00pm. Belmont Station will also be selling its share of bottles of 2015 BCBS, BCB Coffee Stout, BCB Barleywine, and BCB Regal Rye Stout. Tin Bucket will begin selling its bottle allotment at this time and the its BCBS draft offerings will be tapped at 3:00pm. Arch Bridge Taphouse in Oregon City will have bottles of BCBS, BCB Barleywine and Rare Bourbon County Brand Stout for sale and will be pouring draft when it opens at 2:00pm today. Then at 5:00pm Woodstock Wine & Deli will begin selling BCBS and BCB Barleywine.